The following is by Ed Fogarty, associate professor of political science, director of the International Relations program, and Eurosim faculty adviser. 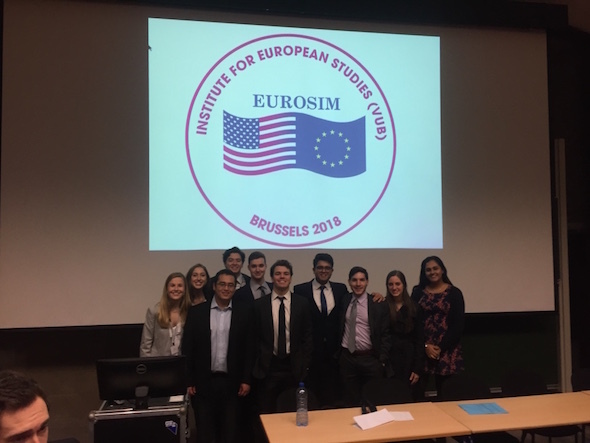 January 4–7, 2018, a delegation of 14 Colgate students traveled to Brussels, Belgium, to participate in the 31st meeting of Eurosim, a Model European Union program in which university students from Europe and the United States gather to simulate the process of passing legislation in the EU. The 2018 event, hosted by the Free University of Brussels (VUB), addressed border security in the European Union, including specific topics such as advanced screening methods and data retention. The simulation produced a successful legislative compromise between delegates seeking tougher border security measures and those seeking to uphold both civil liberties and privacy. 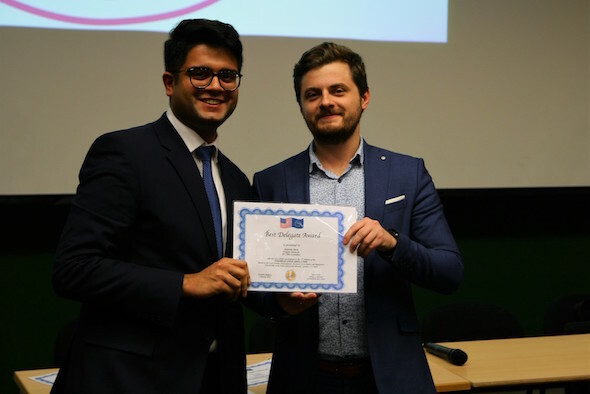 One member of Colgate’s delegation, Shameer Zahid ’18, received an award for ‘best delegate’ — one of only four such awards given to the 150 participants — for his efforts as the chair of the European Parliament Committee on Civil Liberties, Justice, and Home Affairs. It is a particular distinction because such awards typically go to European students, many of whom are in masters-level programs and preparing for a career in European Union policy making. Colgate was able to send such a large delegation to Eurosim 2018 due to the generous financial support of a variety of on-campus centers and offices, including: the Center for Freedom and Western Civilization; the Center for Learning, Teaching, and Research; the Dean of the College; the Dean of the Faculty; the Department of Political Science (Storing and Rakin funds); the Division of the Social Sciences; the International Relations program; and the Lampert Institute for Civic and Global Affairs. The 2019 meeting of Eurosim will take place at St. John Fisher college in Rochester, NY.